How to relieve the symptoms of IBS and heal your digestive system. One in five people are affected by Irritable Bowel Syndrome. If you are one of them, then you know that the medical profession can do little to relieve this distressing condition. Luckily, help is at hand. Leading nutritionist Dr Marilyn Glenville, PhD, has applied her many years of clinical experience to bring you a lasting solution. Full of practical nutritional advice, as well as suggestions for ways to help tackle emotional wellbeing, this brilliant book offers the vital support that you need. Don’t let IBS rule your life. 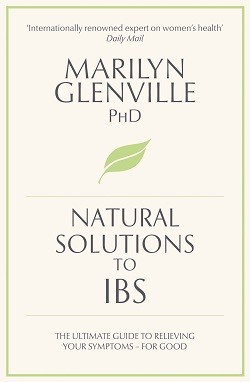 Follow Marilyn’s guidance and simple step-by-step 7-day diet and healthy-living plan and relieve your IBS symptoms – for good. Based on 30 years experience in her clinics, this tailor-made programme doesn’t just focus on the symptoms but looks at the causes and takes a holistic, natural approach. And although it is proven to be effective on its own, Marilyn also lays out the medical options so you can make an informed decision the most effective treatment for you. Chapter 1 – What is IBS? "So, if you would like to improve your chances of relieving the symptoms of IBS for good you should send for this book now." Natural Solutions to IBS Book at The Natural Health Practice.